A screen capture from the Juntos Facebook Live stream of its protest at Illegal Tacos. Juntos, the South Philly-based organization fighting for the rights of the Latinx immigrant community, protested outside Illegal Tacos on Broad Street on Tuesday evening. 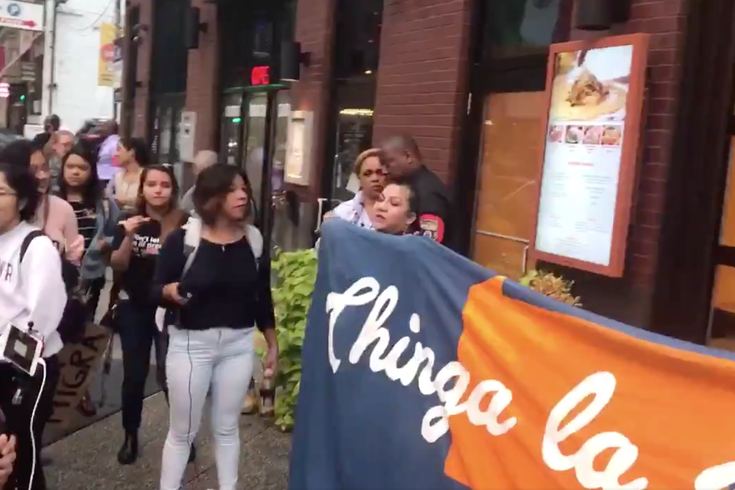 Protesters blasted music in front of the restaurant and held signs from the day’s earlier #ChingaLaMigraPhilly protests at the Philadelphia ICE offices, and booed people who appeared to be heading into Illegal Tacos for food. At one point, the Facebook Live streaming from the Mijente Facebook page showed the crowd chanted “Shame on you!” at customers leaving the restaurant. Around 7 p.m., a Juntos member headed into the restaurant to hand signed petitions to the restaurant's owner, Florian Furxhiu. Illegal Tacos, for the uninitiated, is a taco shop opened in February by Albanian immigrant Florian Furxhiu. Furxhiu told Eater Philly before the shop opened that he knew the name might be controversial, but he felt it was funny. Since the opening, a number of petitions have popped up across the internet protesting the name and the restaurant. Illegal Tacos previously posted a picture featuring ICE officers eating at the restaurant. Juntos organized “free authentic tacos” afterwards for those attending the protest.